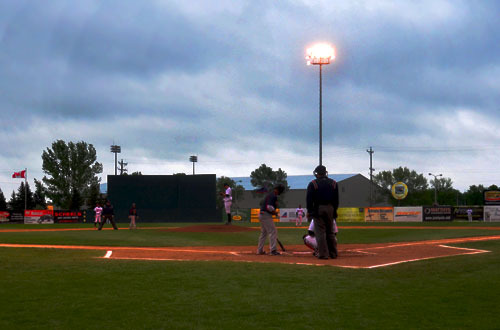 The Fargo-Moorhead RedHawks and Sioux Falls Canaries split a doubleheader to complete a four-game series on Thursday, May 30, at Newman Outdoor Field. Jake Laber pitched six scoreless innings enroute to a RedHawks victory in game one – his first victory of the season. The first game of the doubleheader began at 5 p.m., but only completed one inning before being delayed for an hour and 48 minutes. A rubber match ensued, as both starters returned to the game after the delay, neither allowing a run in the first five innings. Canaries’ starter, Kyle Ruwe entered Thursday’s start with a 2-0 record and an ERA of 1.76. Ruwe got himself out of a jam in the bottom of the third, as the RedHawks loaded the bases off of two straight singles from Todd Jennings and Buddy Sosnoskie and a Nic Jackson walk. Ruwe followed that by striking out Tim Alberts, ending a ‘Hawks rally. After putting on two runners in the fourth, Laber helped himself with a slide towards home to make the play to first as Canaries’ J.P. Ramirez put down a sacrifice bunt then followed it up with a strikeout to end the inning. Fargo-Moorhead played small ball in the sixth, as Alberts redeemed himself with an RBI double over the head of Canaries left fielder Ramirez to score Jackson from first. Ruwe issued an intentional walk to Ronnie Bourquin to load the bases for Jennings, who hit a sacrifice fly to left field. Sosnoskie gained his second hit of the game as he legged out a grounder. Ruwe’s day was over after 5 2/3 innings as Matt Daly comes in to get the last out, getting Sioux Falls out of the rut. Sosnoskie quietly went 2-for-3 with two singles and was the only RedHawk with a multiple hits in game one. Chase Johnson came in to close out the game in the seventh. He earned his second save of the season after throwing just 12 pitches and facing the minimum batters. The Sioux Falls Canaries avoided the series sweep with a 9-8 win over the Fargo-Moorhead RedHawks in game two of the doubleheader. The second game of the doubleheader began the opposite way of the first, as both teams plated two runs apiece and combined for seven hits in the first inning. Sioux Falls racked up runs in the first half of the game, scoring two more in the second and five in the fourth as Jared Clark and Tim Pahuta both hit home runs. Nick Van Stratten went 2-for-2, scoring three runs in the lead-off spot for the Canaries. J.P. Ramirez went 3-for-4 for with two doubles and a single in his first three at-bats, tallying three RBIs. Fargo-Moorhead fought their way back in the bottom of the sixth, scoring four runs to bring the game within two. Cesar and Bourquin hit two straight singles and Ryan Pineda followed with an RBI single. With that single, Pineda extended his hit streak to seven games. Zach Penprase cut the deficit with a triple into the right-field corner to score Bourquin and Pineda. Jackson hit an RBI double to bring the game within two after Jose Garcia drew a walk. Alberts was intentionally walked to load the bases but Brachold and Cesar both record outs to end the inning. The ‘Hawks tried to carry their rally into the seventh, putting two on base and scored on a wild pitch but fell short in the contest. Walks killed the RedHawks pitchers, issuing seven balls-on-base in the game. Hawks’ starter Paul Burnside went four innings with seven earned runs, nine hits and four walks. Pete Levitt came in the fifth to relieve Burnside, pitching three scoreless innings with three strikeouts. Nic Jackson and Ronnie Bourquin were both hot at the plate in the nightcap, going 3-for-4. Penprase went 1-for-3, with a pair of runs as well as two RBIs. Fargo-Moorhead and Sioux Falls both sit 5-9 in the North Division. The RedHawks head north this weekend for a three-game set against the division-leading Winnipeg Goldeyes, but return to Newman Outdoor Field Monday, June 3, to take on the Lincoln Saltdogs at 7:02 p.m. Tickets are available at fmredhawks.com or by calling (701) 235-6161.